Willow Manor is a brand new Custom Home that sleeps 18 guests. It is located in the hills east of Prescott just 7 miles or 12 minutes from Downtown Prescott. This beautiful property has all the ingredients for wonderful get-togethers or reunions with family and friends. When you enter the home your attention is captured by the spectacular Pine Barrel ceiling over the living area and the amazing view out the Arched, Grand Picture window. Willow Manor has great southern and eastern views of the Bradshaw and Mingus Mountains. This accommodation was designed and built by an award-winning architect with unique features and spaces functional for large groups on Vacation. The Living Area contains comfortable, leather furniture and artful décor surrounding the Rocked Gas Fireplace. There are Three Bedrooms on the Main Floor. The spacious Master Bedroom has a Queen bed and access to an 8-person Hot Tub out on the deck. The huge En Suite Bath includes a double vanity, soaking bathtub, glass-block shower and large, walk-in closet. A Barn-Door Screen provides a unique style of privacy between the bathroom and bedroom. Hexagon tile and Quartz countertops are featured in this bathroom as well as other rooms in the home. Subway tile was first used predominantly in the train and subway stations of New York City back in the late 1800’s and eventually found its way into homes and public spaces. The Willow Bedroom on the other end of the main level also has a queen bed and en suite bath with a tub/shower combination. It also opens out to the deck with lounges. A third bedroom called the Cozy Queen Room is just down the hall from the kitchen. The well-appointed kitchen is a Chef’s Delight! You will find everything you need to prepare a 4-course meal for a full house or simple snacks for the kids. This modern cooking space has a five-burner gas stove, stainless steel appliances as well as a propane grill right outside on the deck. The beautiful dining area has a table that seats 8. There is additional seating at the bar along the island counter and outside on the deck. Deck furniture is convenient for your first cup of coffee in the morning, a BBQ lunch or a relaxing glass of wine at night. Downstairs you will find 2 more Queen Bedrooms that share a Hall Bath. The Floral Bedroom has an additional futon couch that makes into a full-sized bed. The downstairs Living Room has a sleeper Queen couch and 2nd Gas Fireplace. The Bunk House Nook with 2 Twin beds adjoins this comfortable space. The Large Game Room has everything you need for entertaining kids of every age and generation. There is another half bath in the Game Room. This spacious area includes Pool, Ping-Pong, Foosball Tables and a large Gaming Station TV with X-Box and Wii. There is another Futon Couch/Bed for resting between games that can also sleep two. All of the lower level rooms open out onto another deck with outside seating. Solid wood and stained concrete floors compliment the uniqueness and fine quality of this luxurious Vacation Rental. Willow Manor is located in an eclectic neighborhood with a variety of houses both large and small. 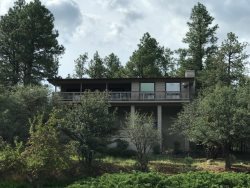 Once inside, outdoor distractions fall away and you are enjoying one of the largest, most desirable properties that Prescott Cabin Rentals has to offer! Of course this home also features Wifi, Satellite TV, Central A/C and Heat and Washer/Dryer. There is a 2-Car Garage is with additional driveway and street parking. Come to Prescott for the Weather, Hiking, Biking, Forests, Mountains, Shopping, Restaurants, Museums and Lakes. Stay at Willow Manor for everything else! We try to make the large accommodations reasonable for smaller groups. It would be hard to put one price on a home that would be fair for 4 guests or 18 guests. The rates are based on 4 person occupancy. Extra guests over 4 persons are $20 per guest per night. Thank you.